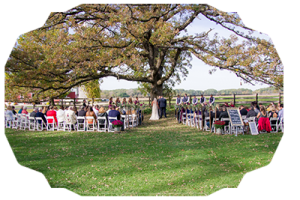 Set back on a peaceful beautiful country road, the Sugarland offers a restored Barn or large oak tree for the ceremony. There is also a farmhouse located just across the road that may be reserved for you and your wedding party to get ready at or relax at after the wedding. 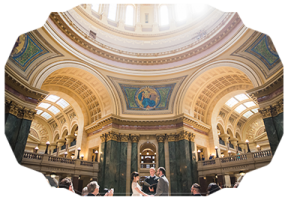 If you having an intimate wedding, the Capitol Rotunda can accommodate around 30 guests. With the intricate walls, arches, & marble throughout the building, this is perfect for the short & sweet wedding. Located near the heart of Madison, the Edgewater hotel is a perfect location for any size of wedding. Offering many locations for the ceremony and ballrooms for the reception. It over looks the lake on one side and the Capitol out the other. Pamperin Park is the perfect venue for a semi-small wedding. It features a unique pavilion with a copper dome or the option of a small gazebo set against a tree line & surrounded by flowers. The Harley Davidson Museum is perfect for the elegant wedding and the edgy wedding at the same time. With many different locations for the ceremony and reception, this venue will surely impress. 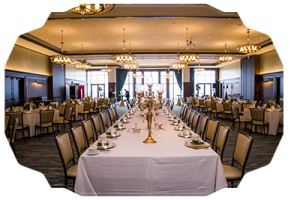 Multiple options for your ceremony & reception at the Lake Windsor Golf Club. With a Gazebo right outside of the clubhouse, its the perfect option for an outdoor ceremony. Windows line both the banquets halls providing a perfect view of the golf course & lake. The large banquet halls and exquisite decor offer a wonderful location for an indoor ceremony or reception. The ultimate reception venue for a great party, the Majestic offers theater seating for your guests, a great dance floor, & a stage for the head table. Offering numerous locations for an outdoor ceremony and a beautiful setting for an indoor reception, the Cedarhurst mansion is quite the impressive venue.